Some love for wolf spiders on Why Evolution is True. Yes, Lycosidae females are remarkable in carrying wee spiderlings around on their abdomen. Spider research in the 21st Century. Now that’s a book Araneologists will like on their bookshelf! I will order mine soon. Harmless spiders: It was a big week for my blog post on “Spiders do not Bite” – it showed up on Reddit and this resulted in almost 3,000 hits in a single day (a record-breaking day for me!). In those Reddit comments, someone posted the paper about a house in Kansas with over 2,000 brown recluse spiders. Guess what: NO envenomations occurred. A spider hunt on the beach. Some lovely jumping spiders were found! So much paranoia about insects over the past week! First up, CRAZY ANTS EAT ELECTRONICS! Um, calm down everyone. Here’s the real story. Alex Wild also has also written about these crazy ants. Speaking of UF Entomology -they tweeted a lovely video of a black widow spider. How about those beetles in Canada! Here’s a pretty impressive list of new records! An avenue of ghosts in Cambridge – it’s all about the insects, really. Stunning, and I mean STUNNING biodiversity illustrations. 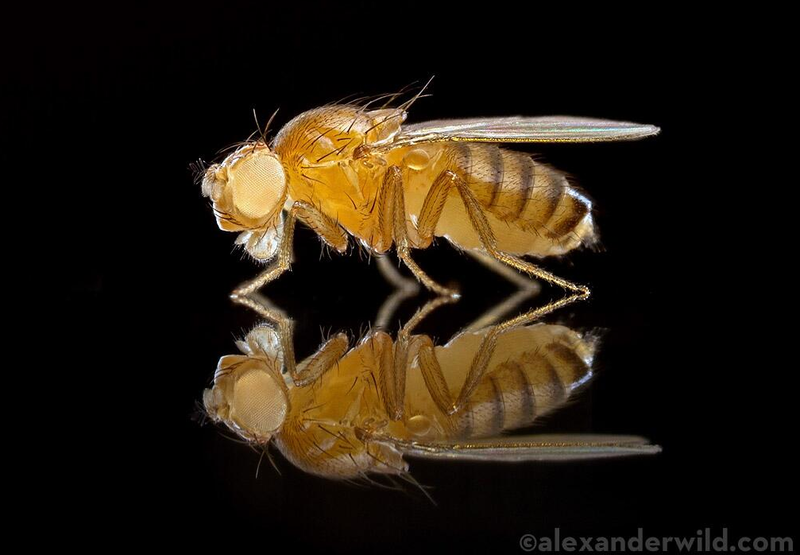 Speaking of stunning, Alex Wild took some incredible photographs of a white-eyed Drosophila mutant. A photo by Alex Wild, reproduced here with permission. See more of his work here. Hairy Mites! Macromite has a new post up. Bugs behind the walls… Wallcology as a way to teach kids about ecology. Blogging for Academics. A terrific Prezi by Jon Tennant. How science education changes your drawing style. Wow. Don’t try this at home: Do it yourself brain stimulator. Sigh. Just not cool. Does the dog die? A critical question before watching a movie. Check here to find out. As spring in my part of the world makes way for summer, this means Asparagus season is ending. I do love eating Asparagus. I don’t, however, love the after-effects. To end with a little Woody Guthrie. A friend and colleague told me he cited the good Mr. Guthrie in a scientific paper! A+ for that! – click here and read the first paragraph.